Congrats to Dale and Karen McKillips for their outstanding and "Perfect" Rally run! Don and Jim both shot a hole-in-one recently! Jim's ace was during the Men's Wednesday Executive group and he cashed in for $100! Don's was with another weekly group and he also took all the money! Jane Ashbaugh scored a hole-in-one on the 4th hole of Bacall! Way to go, Jane! The Yellow Team went "wire to wire" as they trounced the Green Team by a total score of 25-11 (more or less). 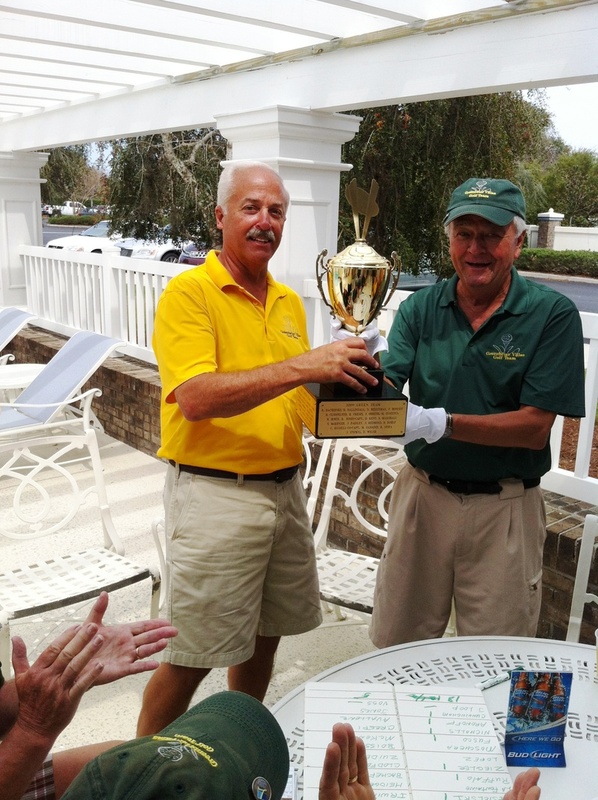 Green Captain, Rich Heidger relinquished the "Greenbriar Trophy" (wearing the traditional "white golves" to the Yellow Captain, Donn Cunningham. Many thanks to all who participated. After year 4, the competition is tied at 2 titles for each team! Year 5, most likely held in February, 2014 should be a spirited contest! Russ Jones, PPTA Certified Developmental Coach, along with partner Ruth Weil of The Villages, competed in the American Platform Tennis Association 60+ Mixed Doubles National Championships held in January in The Villages. Russ and Ruth finished in 4th place, and are nationally ranked #4 in the country. The field of players were from New York, Maryland, South Florida, Connecticut, South Carolina, Washington, DC, and The Villages. Linda Russell joins our list of recent aces! This summer, Linda scored a hole-in-one and joins those who many of us envy. Way to go Linda!!! That's right! Some of our Snowbirds do play golf when they head back north, but Rich does it in style! Congrats to Rich on his Hole-In-One at a local course in the St. Louis area. Playing with a relative who thought he saw the ball go in, Rich swore he could still see it. Upon reaching the green, sure enough, the ball was resting on the lip of the cup against the flag pole. Once the flag was removed, the ball fell in. Way to go, Rich! Way to go, Bill! Bill scored a hole-in-one on Monday, April 9 on the third hole (97 yards) of Hawkes Bay. Bill used a sand wedge. This is Bill's second ace. His first one was back in '63. Congrats! Linda Berryman recently shot her THIRD hole-in-one! Way to go Linda! Most of us are still waiting for our first!!!! Donn scored his first "Hole-in One" recently at Bogart Golf Course. It happened at the 106 yard 4th hole. Way to go, Donn! Russ is "Lovin' the Lifestyle"
Our very own Maggie Kurtz won second place in The Villages Photo Contest with her entry in the "Around the Villages" category. Last year, Maggie won an Honomorable Mention for her flower submission. Next year, Maggie, we are looking for a first place or "Best of Show," so start snapping those pictures. Way to go! 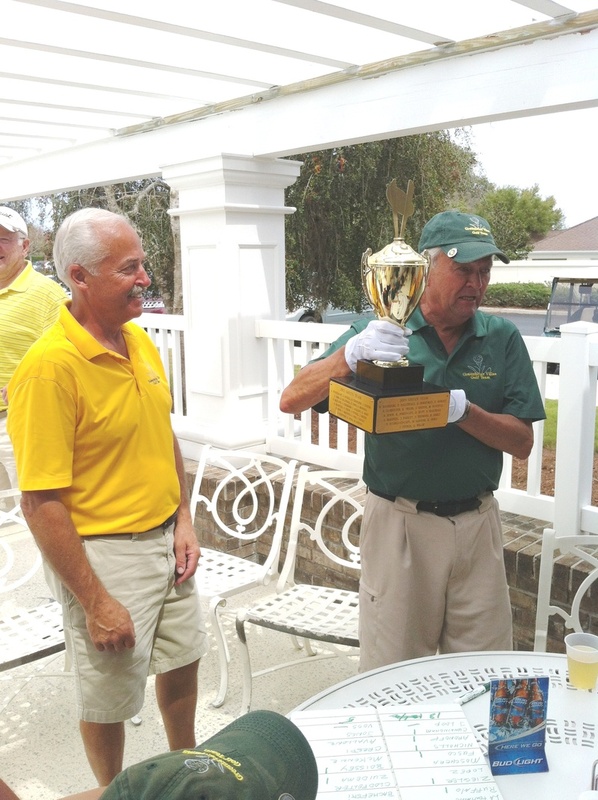 The first annual Oasis Cup, pitting Greenbriar Villas against Calumet Grove, was a huge success. Greenbriar holds claim to the 2010 Championship title by defeating the team from Calumet Grove by a score of 31.5 to 19.5 after three weeks of Ryder Cup style matches. The turnout from both teams was remarkable with 50+ players competing each week. The "Cup" is on display at the Oasis Grill Pool Bar and team photos will soon be on display as well. Congratulations to all of the players and supporters of the Greenbriar Villas Golf Team! Charlie Brower scores a hole-in-one during the Oasis Cup competition! Jo Jones, after competing in the Florida State Women's Bowling Tournament finished 83rd out of over 1,900 participants! Congratulations to Jo for "cashing" at the tournament. Congrats to Jim Kurtz for successfully qualifying for The Resident Cup with a pair of 78s. Jim Redmond had a recent Hole-In-One; and was a medalist in the tennis competition of the The Villages Senior Games. Jim Kurtz and his Mixed Doubles Pickleball partner were finalists in the Advanced Pickleball for the Senior Games! Maggie Kurtz wins second place in The Villages 2011 Photo Contest!